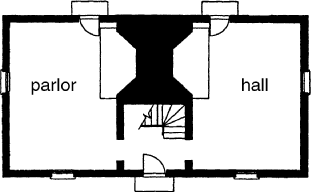 A common two-room floor plan in early colonial New England; the front door opened into a small vestibule, called a porch, which contained two interior doors leading to the two rooms of the house. One room, the hall, 1, served as the center of activity for the entire family; the other room, the parlor, contained the best furniture, as well as a bed for the parents. These rooms were separated by a wall containing a massive chimney that served them both. A loft space above was reached by a stairway in the hall. Also see center-hall plan.